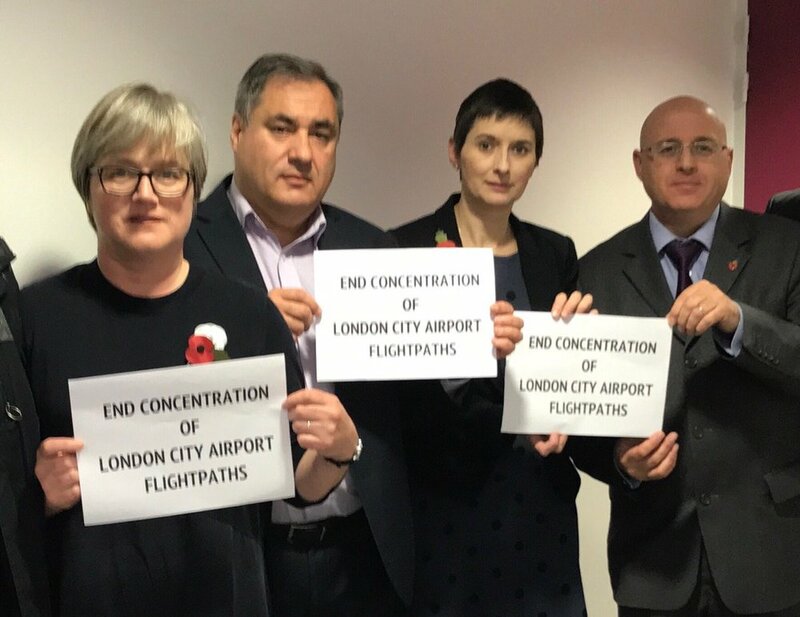 Our Chair, John Stewart and Campaign Co-Ordinator Rob Barnstone met with the Civil Aviation Authority (CAA) on Wednesday [15 June] to discuss the concentrated flight paths at London City Airport. The CAA fielded at team of five and gave us nearly 2 hours. They are aware of the unhappiness amongst communities and local authorities at their decision to allow City Airport to concentrate its flight paths in February 2016. They listened to what we had to say. Things had changed noticeably for many communities in East and NE London. City Airport had argued that they could get away with minimal consultation because the changes they were making were not significant as many of the planes were already flying something approaching concentrated routes. We pointed out that many people had noticed a real difference since February. We also pointed out that the CAA seemed to have no mechanism to look at changes over time. The only reason City Airport could even begin to argue during the consultation that some of the changes proposed were not significant (for example, departures over Leyton, Leytonstone and Wansted areas) was because “significant changes” had been made in 2008 when the flight paths were changed to accommodate the larger planes which needed to make a much wider turn when leaving the airport. The smaller ‘turbo-prop’ planes made a sharp turn when taking off, barely flying over many of the areas that now are under a concentrated flight path. The CAA seemed to accept our point that there was no organisation responsible for assessing the changes over time. We also outlined what the February changes meant for South London. City aircraft fly over South London when an east wind is blowing before turning over the West End and City to land at the airport. Until February they were dispersed pretty widely over South London but now they are concentrated over particular communities. Most of these communities are overflown by Heathrow planes on the days there is a west wind. They now get concentrated City aircraft when there is an east wind, thus no break from aircraft noise. The CAA accepted that there was no organisation which assessing the implication of these kind of flight path changes. We stressed that respite was important to local communities. The CAA felt the introduction of respite was difficult in East and North East London because the airspace City aircraft use is very constrained – largely by Heathrow aircraft. Therefore, spreading City aircraft or creating additional flights paths (in order for those under concentrated flight paths to obtain respite) would be difficult. They accepted that this would be less problematic South London, although an expansion of the airspace which City aircraft are permitted to use might be required. 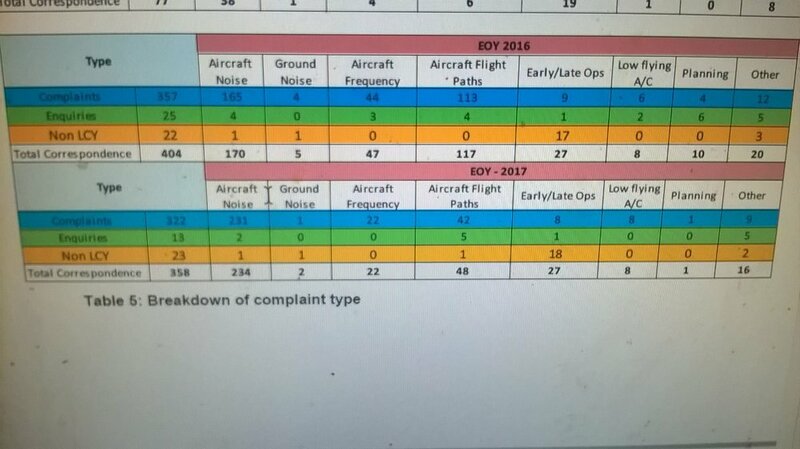 City Airport is required to gather data on whether the airspace changes made in February are functioning as expected. 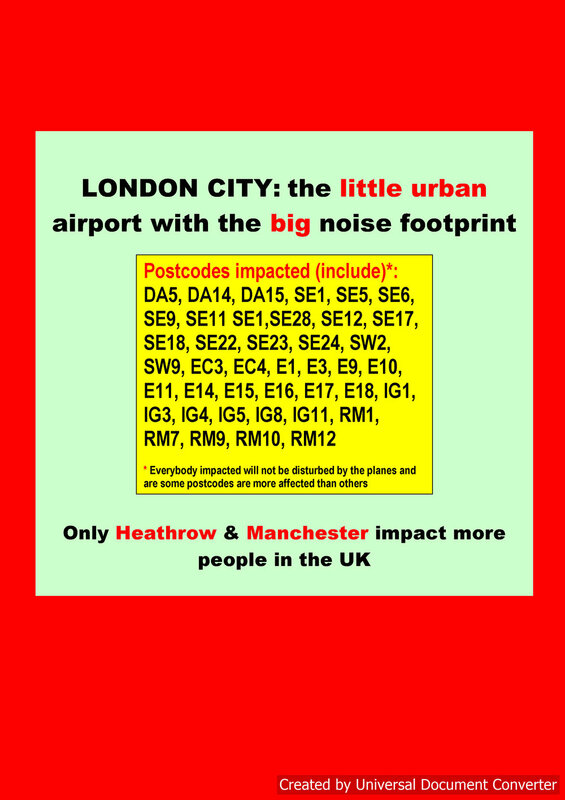 The data gathered will also include a noise impact – City Airport would need to record any unintended consequences. That data must arrive at the CAA by February 2017 (although the CAA would be looking for a 6-month interim report). The CAA will then analyse that data and decide within three months, in May 2017, whether changes need to be made or to authorise the continuation of the scheme. However, the CAA played down the likelihood that they would intervene to make changes, and they certainly won’t propose or initiate changes. They are likely, though, to take into consideration any significant discontent from local communities or local authorities about the changes. It became clear that pressure needs to be put on the airport by communities and local authorities to consider changes. City Airport is keen on the concentrated routes because they make it easier to guide planes when landing and taking off. NATS also like them because the new computer technology in the planes means that air traffic controllers are much less involved in guiding the them, thus saving NATS time and money. · Encourage local people to email and write to the airport and the CAA. Email or write to the airport and the CAA to tell them about your experience of living under the concentrated flight paths. Two key contacts are below. Please include info@hacaneast.org.uk in your emails to one of the above organisations, as it helps us build an even broader picture of your thoughts and feelings on the issue.